There’s more in store for guests at Disney’s Animal Kingdom than just animals and attractions. The next time you are walking between Africa and Asia, be sure to keep your eyes peeled for any movement in the foliage around you. You may be surprised to find out that the vines aren’t just living, they’re alive! Many guests have had the pleasure to happen upon DiVine as they make their way out of the bustling town of Harambe – though I’m sure many more have passed by her without the slightest idea that she was even there. 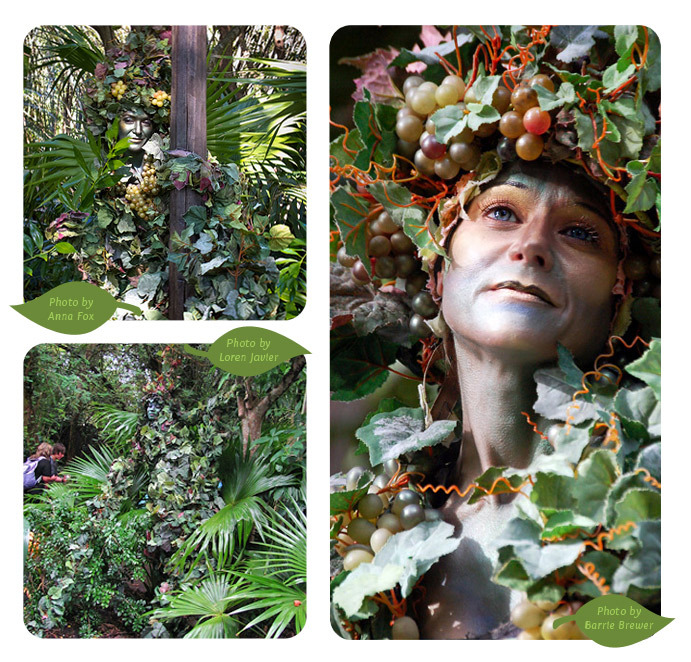 DiVine is a performance artist on stilts who is expertly camouflaged to blend in with the surrounding vegetation. She is barely noticeable as she rests quietly near a tree or a sign post. When she awakens she begins to move ever so slowly, fluidly making her way onto the path, delighting passing guests who are surprised when she comes alive. Her performance is enchanting and mesmerizing. She doesn’t talk or sign autographs – in fact, she barely pays attention to people at all. She’s there simply to entertain and to remind us to slow down and look at our surroundings. But trust me, once you actually see DiVine, you won’t be able to take your eyes off her.